“Arrrr!” ordered Captain Armata . That wouldn’t have much of an effect on most other ships, but the Kosc was a pirate ship. Everyone on board knew what Arrrr meant in any possible inflection, they were fluent in pirate and buccaneer, some understood corsair as well. “Arrrr!” confirmed the deck officer, then yelled for everyone on deck to hear. “ARRRRR!”. Every crew member knew what they had to do. Sails unfurled and turned into the wind. The helm turned to starboard. Quicker than expected for a ship her size, the Kosc turned towards its prey, a merchant vessel lying deep in the water with cargo. “Arrrr!” the crew cheered, waving cutlasses, knifes and one misplaced pitchfork in the air. Finally, booty. Portal Games have long been known for heavy games popular with games worldwide, games like Neuroshima Hex, Robinso Crusoe: Adventure on the Cursed Island or worker placement game Pret-a-Porter. Rattle, Battle, Grab the Loot, one of Portal’s Essen releases last year, does not continue that series of games. The pirate game is a lighter, family friendly dice game, although dice game is misleading because dice are used in a very unusual fashion. 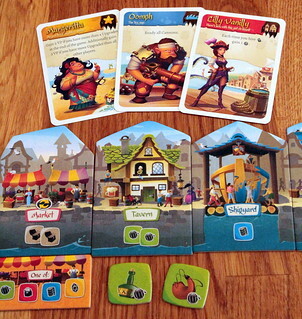 Each player in Rattle, Battle, Grab the Loot commands a fleet of three pirate ships – that is dice – in their pursuit of freedom, happiness and, most of all, loot. 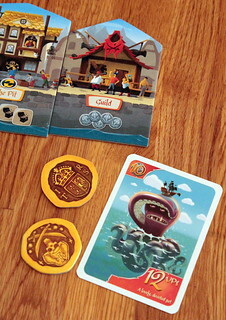 They hunt loot all over the seven seas – the game box – to later invest it wisely into crew and equipment for their ships. A game of Rattle, Battle follows a scenario, represented by a deck of adventure cards, and although the rules as written are more convoluted than they needed to be playing the game is easy and quick enough. The Adventure Card reveals what enemies (or victims, the border between the two is blurry to a real pirate) the players will face. Six different colors of transparent dice are enemy ships of different strengths. Knowing the odds what the enemy ship dice may roll, each player decides how many of their own ships to send into battle. The pirate thing to do would be to attack with all you have, of course, but strategy must win over tradition sometimes, ship repairs are expensive. Once all players made their choice, the Baron – what we pirates call the start player – pick up all the dice, player and non-player alike, and drops them all into the bottom of the game box at once. I suspect one reason why the Boardgamegeek community recommends a higher minimum age than Portal’s eight plus is that younger children have too small hands to pick up all those dice. Some adventures also show non-player ships in specific locations in the game box, those are arranged there before the dice drop. After the dice hit the box with a roll of thunder the real battle begins. The non-player ships go first with their special abilities. 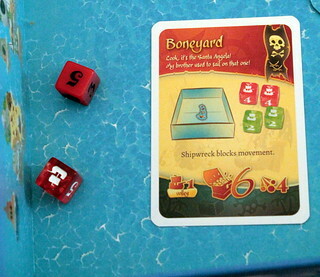 The meaning of the ship and skull-n-crossbones symbols on the non-player dice depend on the Adventure card, but they are mostly not great for the players. In the best case, the ship escapes before the players have a chance to attack and plunder. But only cowardly merchants flee from pirates. When you encounter the Royal Navy, they are more likely to sink the closest player ship with a cannon volley or even blow up their own vessel and take more pirates with them. Once those ships are done, the players have their turn. This is still not the battle, just the preparation for it. Players’ options depend on the equipment they have on their ships. To start with, they can use a Sail to move a ship or two Cannons – both from equipment or one from equipment and one from a cannon dice result – to fire at an enemy and sink him immediately. Range for both actions is determined with cards: to see how far you can move, hold the long side of the Adventure card to your ship and move it to any position along the card. Shooting works the same way but uses the short side of the card. Word of advice here: make sure to use the Adventure Card to measure. We used whichever card at first, until we realized not all cards have the same size. Yeah, evil trap there, thanks Ignacy. Opening salvos done, now the real battle starts, and unfortunately it takes a bit of bureaucracy. The Battle is resolved as a series of encounters between a player and a non-player ship, the pirate code doesn’t allow battles between pirates. Here’s where it gets fiddly. The order of encounters is that you resolve the encounter with the smallest distance between the two dice involved first. In a cluster of dice, figuring that out can lead to some discussion, and using the included ruler without disturbing any of the dice takes more manual dexterity than I have. I mean, than an eight year old has. Phew, I think no one noticed. But once you know who will fight, resolving the fight is easy: the higher number wins. For dice showing a number, that’s pretty obvious. Non-player dice showing a symbol have the strength given on the Adventure card, the strength of a player dice showing a cannon depends on the number of Cannons the player owns. The defeated dice is removed and the next encounter resolved. If that again involves the remaining dice, then so be it. We’ve had a non-player ship sinking seven player ships in a row that way. The battle is over when no more encounters can happen, meaning when only player or non-player ships are left. And then comes the event we’ve all been waiting for: loot! For each ship you sank you receive one silver coin. For each ship you boarded, meaning your dice were touching, you receive a loot tile, and then you get some more loot as written on the Adventure card. Repair your ships that were just not good enough, stow the loot in your holds and off you go to the next adventure. Not all Adventures are sea battles, by the way. In between you get Crazy Adventures that could be pretty much anything and don’t involve throwing your ships in the box. The Adventures are one half of Rattle, Battle, Grab the Loot. After two or three of them, you and your crew deserve a stop at the nearest port. That’s where the other half happens, here you spend your loot. Because pirates don’t have savings accounts! The port has six locations that are always resolved in the same order. First, players can go to the Market where they may exchange loot for … other loot. Loot from boarding ships comes in different types, like Rum or Spices, and the Market lets you trade two tokens of whatever types for one token that you want. Why would you want that? Because, landlubber, the next stop is the Tavern where you hire Sailors. And they only accept Rum. Sailors are one way to enhance your ship, they offer useful special abilities and sometimes even bring a hiring bonus on board when you pick them. To hire Sailors, you draw three Sailor cards and keep one of them. At the next stop, the Shipyard, you buy standard equipment: Sails to go faster, Cannons to shoot more often and Holds to hold more loot, because nothing is sadder than leaving all that good loot floating in the ocean. At the Workshop you buy equipment that is definitely not standard, and probably wouldn’t be a approved by the Department of Marauder Vessels (DMV). Shopping at the Workshop works the same as hiring Sailors, you draw three cards and pick one, but here you buy things like Super Cannons that double your cannons’ range. Or the Big Bertha that gives one cannon unlimited range. And it’s not all about Cannons, either, why not buy a Parrot that lets you move a non-player ship? After the Workshop you still visit the Pit where you sell Loot for Coins and finally the Pirates’ Guild where you buy Victory Point Cards for Coins. You don’t have to buy those cards, Coins are worth VP as well, but the cards are always worth more than they cost. The Port is where the more strategic part of the game happens. Picking the right Sailors and Upgrades for your ship is what makes you win the next game. And there’s no right way to do it, the best choice depends on the game. Boarding Hooks to get more loot are a great idea – unless the other players all invest in cannons and sink everything before you get a chance to board. Rattle, Battle, Grab the Loot is a game with two very different parts: the strategic acquisition of upgrades and the port and the tactical sea battles, and they do work together pretty well. In one part you collect the resources to use in the other, where you buy the upgrades to use in the first. But while I can’t find any serious flaw in the Port part, the sea battles don’t manage to convince me. And iIt’s not about the luck factor of tossing so many dice into the box, randomness is something I expect in a family game. It’s also not about the decisions you make there, the tactics of positioning are fun and using your equipment to best effect is cool too. But the battles are just so fiddly. You have to move your dice between other dice, but you have to take care not to turn them. You have to measure distances with cards stuck between other dice without moving those, and if you move two millimeters too far someone will complain that you’re now closer than him. And if we’re having trouble with those things, I don’t see them working out too well with kids, either. And that leaves us with a game that is too fiddly for kids to play without a lot of adult help, not deep enough to really catch adult gamers and with playtime of about an is hour too long to work as a filler, not to mention that it needs quite a lot of table space as well. It’s a fun game with a cool, unique mechanic, but it doesn’t quite decide on one target audience.